The main driver behind this whole-house remodel was a desire to “age in place.” Our clients had a comfortable three-story home near family and friends, and they wanted to stay in their home as long as possible. However, they worried about the safety of climbing stairs as they became older, especially with a laundry basket in their hands. 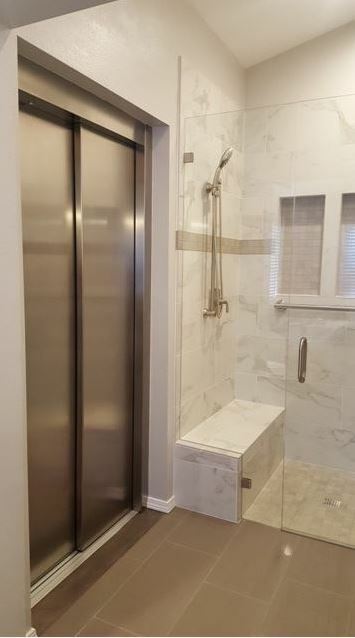 Part of the innovative solution was to turn a small master bath on the top floor into space for an elevator. A three-story addition then provided room for a beautiful new master bath with a walk-in shower and separate Jacuzzi tub. On the main floor, the addition includes a new laundry room, a new sunroom, an extended deck, and an expanded kitchen with a walk-in pantry. The remodel also gave the homeowners an opportunity to update elements that had become outdated, such as flooring and cabinets. The new kitchen is both very functional and gorgeous, with custom maple cabinets and polished quartz countertops. A new custom handrail in the entry is safer and a work of fine craftsmanship. The result is a safe, beautiful home where the homeowners can enjoy their retirement!